April was so, so busy! We celebrated our Lord's resurrection and on the same day, we also celebrated Jason's birthday! We can't ever recall a time when his birthday fell on Easter before, so it made the day extra special. We spent the day at Jason's mom and stepdad's house. 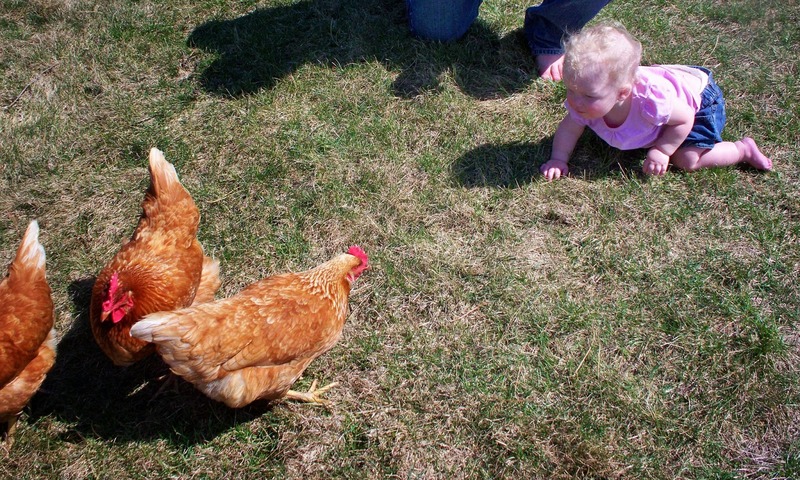 It was our girl's first time encountering their lovely chickens. The chickens scared her a bit, but she really was into pulling up all the grass and watching the wind blow it away. I don't know what the future holds for us in terms of careers. All I know is that we've spent a lot of time in prayer in April and plan to continue praying without ceasing in May. God has already revealed some things to our hearts, and we're still just trying to figure out where to go from here. Either way, I'm excited that Jason and I are both on the same page and that God is revealing the same things to each of us. We expanded our garden this year, and it has been so much fun watching the little sprouts come up! We finally have all the seeds planted for this year. 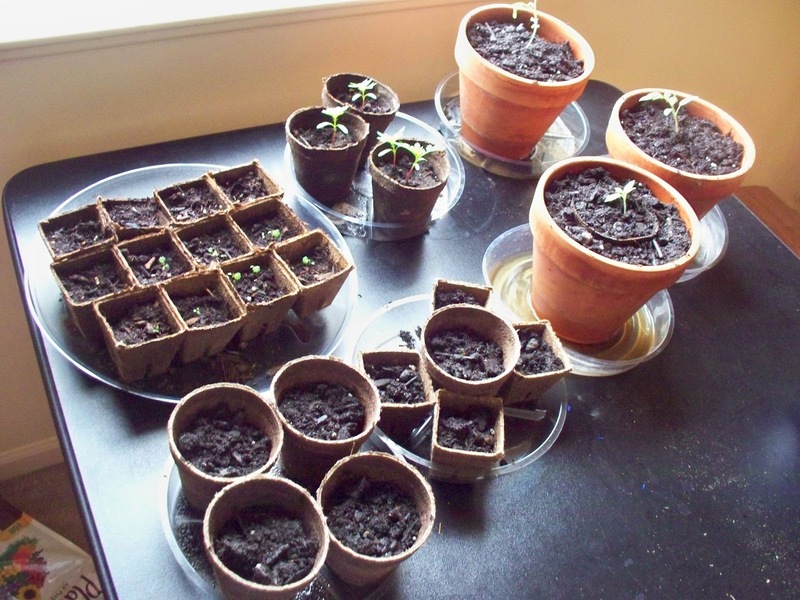 Our tomatoes and marigolds are coming along quite nicely. I'm not sure what to think of the strawberries because I have no experience with them at all. I also have no experience with carrots, but we just planted those so I don't expect anything for a little bit there. At least for this month, I'm going to incorporate our Saving the Moola month in review post with this post. I may do this going forward, as I feel like a lot of the information is overlapped from one post to the other. With that in mind, April was a fruitful month. When I received our electricity/heating/cooling bill at the end of the month, I was pleasantly surprised! We owed $0. I am incredibly excited about this because it means all of my efforts have been paying off. I'll be sharing a blog post soon about what exactly I did to cut our bill so low. I highly doubt it'll be $0 next time, but I'm looking forward to seeing how low I can keep it! Bug had a stomach bug and a cold in April, though the cold was caught from me. It was weird for her to be sick twice in one month and not the funnest thing. She still has no teeth, but every day, we swear she's teething. I really don't know if she is, honestly. I pray she is. Due to her illnesses, her sleep schedule has also been wonky. She slept a lot near the end of the month to catch up on sleep. It is finally garage sale season here in Michigan, and I could not be more excited. We went the last weekend in April, spent $6.50 and scored 2 large pieces of fabric, 1 basket, 2 pairs of pants for Bug, 2 patio chairs and 1 wall hanging (pictured below). I was pretty pleased with my first haul! I also scored some amazing deals at Michael's and am a little obsessed with going there every weekend now. I spend $5 or less every time I go, so the cost is minimal. I'm so choosy about what I buy and work off a list I have of things I'm always looking for (such as note cards with envelopes). Speaking of garage sale season, the weather is finally in spring mode. I took Bug for a few walks in April, and it is so nice to be outside. This summer should be extra fun with a little one running around, though Bug isn't quite walking... yet. 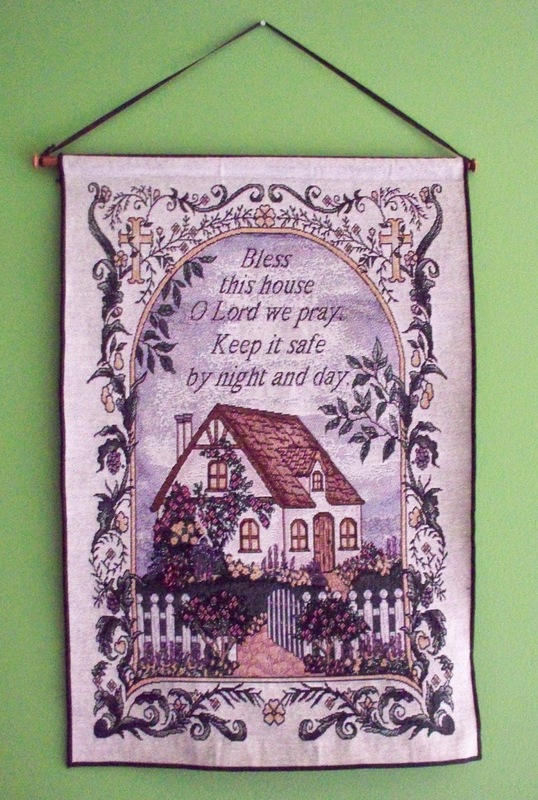 Part of my plan for May is to hit up as many quality garage sales as I can, update Bug's photo album and find a stamped cross stitch kit for myself. Jason enjoys cross stitching and I've always wanted to learn. It can be hard to find a nice stamped kit, though, so my goal is to find one in May so Jason can teach me how to do it. Feel free to share what you did in April and/or any special plans you have for May! Your husband and I are birthday buddies! Belated Birthday Blessings to him! The last time it fell on Easter was in 2003. It will fall on Easter again in 2025 but then we have to wait until 2087 before it happens again!